The Orion spacecraft is fully assembled and ready to be rolled out to the launch pad on November 10th. Surely that means it's time for us to build small paper models to adorn our workspaces as good-luck charms for next month's test flight. 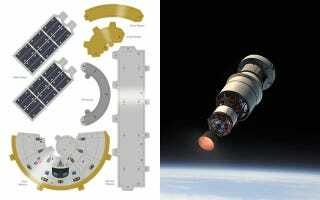 NASA is in the first stages of developing the Orion spacecraft, an all-new vehicle to carry humans off Earth, beyond the moon, and all the way to Mars. It is currently a first-stage prototype, the bare-minimum systems needed to boost the service module into orbit, whip it around the Earth, slow it down, and bring it home. Within the next month, the uncrewed craft will be strapped onto a Delta IV heavy rocket, and blasted off for the first all-systems real-environment test of the crew service module, launch abort system, heat shield, parachutes, and splashdown recovery. I'm a scientist, keeping a detailed a lab notebook for my recipes and stuffing my purse with key components to run science demonstrations before heading out to parties. Yet I'm completely comfortable embracing superstition and ritual when it comes to launches. Particularly after the recent disasters, I'll be endlessly scarfing peanuts during the December 4th launch countdown for Orion's first test flight. Until then, I'll be constructing this adorable paper model and taking it for test flights around my office in the hope that through some sort of voodoo-link our successful flights will teach the big beast of metal how to survive its trial by fire. Download your printable Orion paper model here. Did you make one? Show us a photo of your completed craft in its new home!